Rinse and drain the beans. Finely dice the tomato, and mince the green onions and chipotle. Mash the beans in a flat bowl (I use my skillet) with a potato masher. Peel and pit the avocado and mash it right into the beans. Stir in the tomato, onion, chipotle, and lime juice. To make a wrap, I toast a tortilla right on an open burner with tongs. 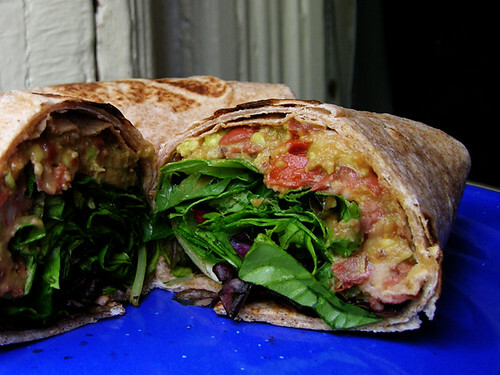 Spread a stripe of bean mash across the middle of the tortilla, top that with salad greens, then roll it up.